Looking for someone decadent and classy to share your life with? Look no further! I, Godiva, am here to be the girl of your dreams. 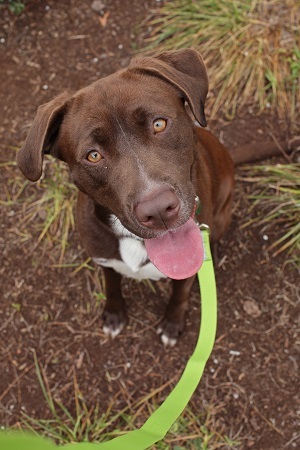 I am a 1 1/2 year old Chocolate Lab mix, who is a real treasure. I am so playful and affectionate, I will keep the serotonin flowing in your brain just like a real bar of chocolate! I have decent leash manners and am potty trained. I play well with others, but would probably do best living as an only dog. I am interested in kitties, but not too much, so I may like a kitty friend. I have plenty of energy to spend all summer hiking, biking, rowing and going so if you are looking for a dog to match your enthusiasm for outdoor activities I am the girl for you! Fill out an application at pixieproject.org so we can schedule a meet and greet. I am fixed, vaccinated and microchipped. My adoption fee is $200.